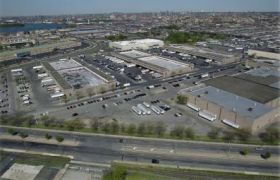 Hunts Point Terminal Produce Market in New York is set to see US$10m in freight rail improvements under a new federal grant approved by the US Department of Transportation. The multi-million dollar investment was announced by US Representative José E Serrano (D-South Bronx) and Joseph Crowley, who have jointly led efforts to help the facility to renovate and modernise, according to a press release. The grant will be used to expand capacity at the facility and help to reduce the number of trucks on the road. “Not only will this investment help the Market create hundreds of new jobs but it will help reduce air pollution by allowing the Market to get shipping trucks off of our roads,” explained Rep Crowley. • Installing additional sorting and storage rail tracks. • Rehabilitating the rail spurs that serve three of the market’s warehouses. • Installing a covered platform on an existing rail spur within the market to facilitate the transfer of produce from railcars to trucks. The additional tracks will add capacity for the delivery and staging of loaded railcars, as well as the storage of empty railcars before they are removed from the market. The rehabilitation of the rail spurs will restore the original elevation of the tracks so railcars align with the warehouse loading docks. The covered platform will provide an additional location where tenants can receive produce by rail, and will provide a safer, more efficient transfer of produce within the market. Serrano and Crowley led congressional efforts in support of the grant application for the federal funding, highlighting the benefits of the renovations for the City and borough both in terms of jobs and in terms of environmental benefits for the surrounding community. But, according to local media reports, the grant represents only half of the US$20.6m needed for the project. Some of the remaining investment will be raised from fees on market merchants.